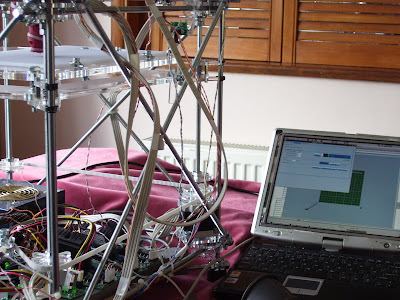 On the RepRap forums, there are several users who have access to some pretty good workshops, either using college or school facilities, even those with lathes and CNC machines at home. I'm not one of those users. I've also got a garage full of junk, but it's also got a black'n'decker workmate, and some standard DIY tools,including a small hacksaw and electric drill. That's about all you need to build a RepRap from a BitsFromBytes kit. Obviously, if you have a full-size workshop, things are much easier - but my RepRap sits behind the TV most of the time. Building from scratch or from a RepStrap would probably be a bit messier and needs a bit more time and equipment, but building from a kit can be done in your living room. It helps a little if you can dedicate some space for a permanent setup (a boxroom or office would do nicely) but my RepRap is sturdy enough to get it out when I'm experimenting and put it away between times. It's alive! It's alive! The beast is alive!